We trudged down the path in the pouring rain back to the cars and drove into town. The daylong downpour had changed the river in to a surged mass of brown waves ferociously tumbling through the Arch. It was an awesome site, and a complete change from the serenity of the sun lit morning's scene only 36 hours ago. On the way back to the hotel I stopped in at the town’s Chauvet Museum which shows the video made by the original discoverers of the cave. I thought it was very good but somehow completely missed the unique atmosphere of the cave. It was a bit like taking a shower wearing a raincoat!. That evening Jean asked us out to dinner at the Research Centre. We had a wonderful evening with the team, meeting the different scientists, all experts in their own field. Thanks to Valerie Feruglio translating for me, I was able to have a long talk with Michel Phillipe, the Bear Man. He has now recorded 172 bear skulls, 53 of which are strewn around the floor of the Altar chamber. 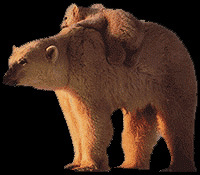 Michel talked about how the bears would have gone into the dark cave as winter set in to give birth to their cubs, which would have been tiny, each only about eight inches long and weighing three lbs. The mothers would suckle them through the winter on fat rich milk as they lay in the pits they had dug, many of which can still be seen on the floor of the cave today. Over the winter months the cubs would have grown to about two feet long and weighed around twenty lbs. They would have moved around in the dark, and like their mothers they scratched the walls. At the entrance of the Holy of Holies you can clearly see the scratches made by their little sharp claws. Michel has found in the cave tiny bones of cubs who died before escaping into the light. After dinner we were given a slide show of the engravings that have recently been discovered at the Cussac Cave near Lascaux. The wonderfully free finger drawings are done on the wet clay surface of the cave walls and are possibly a little younger than the Chauvet paintings, being between 25 to 27,000 years old. One of the exciting things about this cave is the unique discovery of three skeletons, the oldest so far found in France. It is not yet known if the remains are of people who died naturally or were the victims of a gruesome sacrifice to the Spirits of the cave? What was the Bear Clan like and what kind of life did the people have? Of course we can’t see through the Veil, but with our minds we can use our imagination. I personally believe they thought and acted just like us, and they were a Stone Age people similar to The Unambal, the Australian Aborigine Tribe that Doctor Andreas Lommel lived with in 1938. I imagine the Bear Clan was about 50 strong. 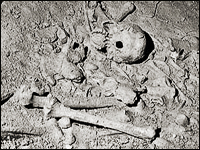 The oldest person was unlikely to be more than 45 years old and was possibly the Medicine Man. 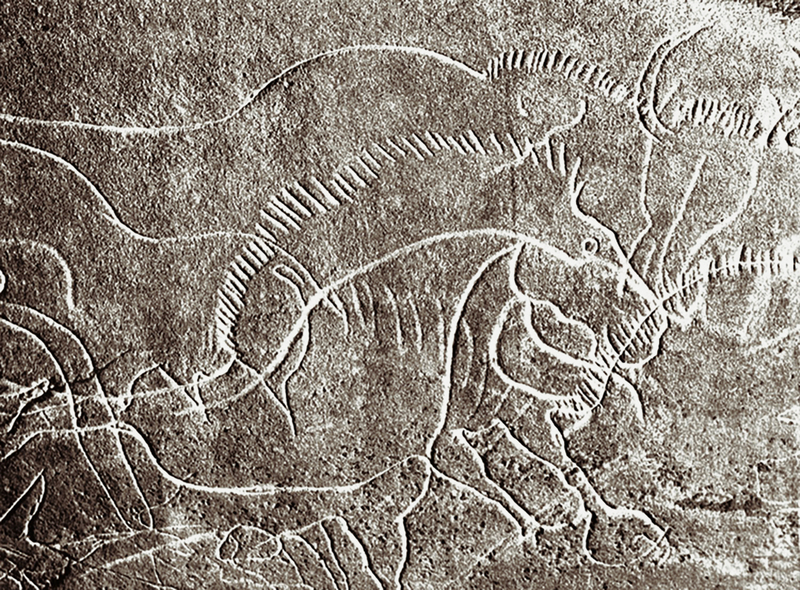 The Chief Hunter and Leader of the Clan might have been 40 years old. He ruled over a clan consisting of say ten men and women aged between 35 and 25, and a younger generation of twenty people between 25 and 15, who were the parents of twenty children. I think a Clan of 52 individuals would have been a manageable group, more than able to live off the grazing herds that migrated up and down the Canyon between their summer and winter pastures. 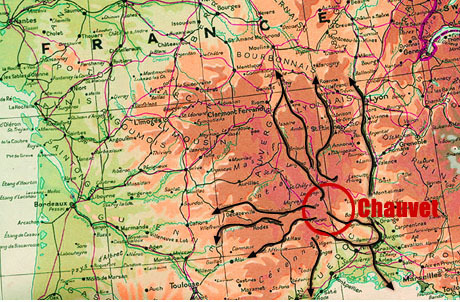 I imagine there must have been several clans hunting the same area of the Rhone Valley and the Central Massif, following different herds of reindeer, bison and horses. 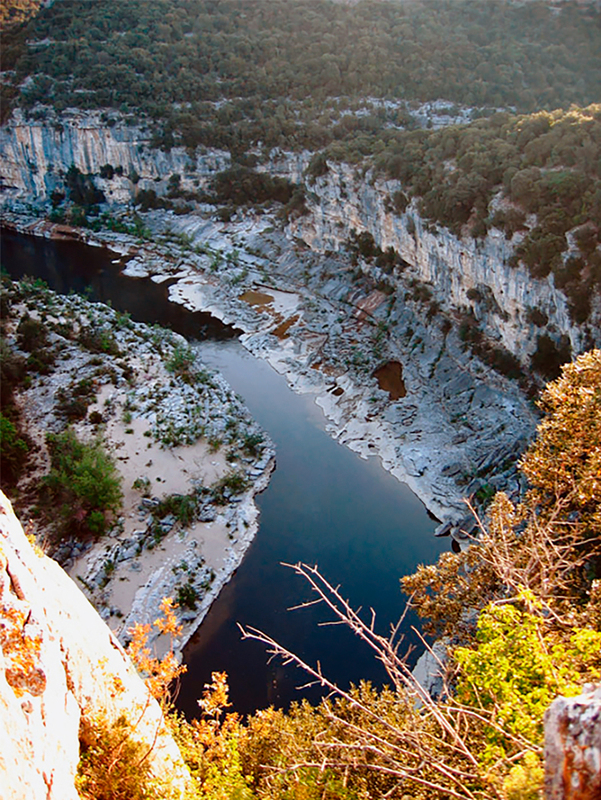 If the migrating herds used the canyon as a main route between their summer and winter grazing, all the Clans would have known of the Pont d’Arc and the Cave. Nine rivers have there source within a 25 mile radius, 3 of which are within 15 mile circle. The Arch is such a significant landmark maybe it became a Tribal meeting place each Spring and Autumn and Chauvet was a tribal Cathedral that served all the Clans. If this is so I imagine that it would have been possible for up to 10 Clans gathering in exactly the same way as the Stone Age aborigines clans that made up the Unambal Tribe used to meet for an annual Corroboree. Up to 500 people would take part in these gatherings, dancing, and singing new songs right through the night. These meetings were socially important to the aborigines as they provided a place where marriages could be arranged. They were literally a genetic melting pot for future generations. The Bear Clan would have needed the same constant input of new blood. When you look down on the vineyard below the terrace on the way up to the cave, it is possible to determine how the landscape was formed long before man came on the scene. The river now cuts through what was a great wall of limestone that forced the river in a wide loop around it. When the river wore away the dam and began instead to flow through the Arch, the loop silted up and became what is now a broad flat valley some 500 yards wide. The migrating herds would have used this passageway to bypass the Arch, which is totally impassable. The valley floor would also have made a perfect campsite for a gathering of the Clans. It is not hard to imagine a Corroboree of singing, dancing, and match making around giant fires that burned all night. Although the Bear Clan people had minds exactly like our own, I wonder if they believed they had souls? Personally I think they would have because they obviously believed they could communicate with the Animal Spirit World just like the Unambal Tribe. Surely this is all part and parcel of what Jung described as the God-image? Thanks to Richard Dawkins, author of The Selfish Gene, I think we now have a very good scientific explanation of why Jung was correct in his assumption. The Human Brain has been doing a lot of thinking over the last 130,000 years. Descartes wrote, “I think therefore I am”. From the evidence of the drawings the Bear Clan were definitely Thinkers but had they thought about “life after death?” I am sure they had. One of the mysteries of Chauvet for me is the absence of human bones. What did the Bear Clan do with dead bodies? One of the problems that have faced Mankind even before he started thinking about the possible existence of a “life after death”, has been how to dispose of dead bodies. I keep on returning to what Doctor Lommel recorded when he was living with the Unambal in 1938. When a member of an Aborigine tribe died their body was placed in the fork of a tree and allowed to decompose. The skull and the long bones were then collected and wrapped in a parcel of tree bark, which looked like a giant Christmas cracker. The man’s widow carried the parcel around for a year before she deposited it in a cave near the painting of the Wandjina God who was the deceased ancestor. These bark parcels disintegrated over a short period of time, but having seen one myself in 1993 in a remote cave in Kimberley, this practice must still have been in use until quite recently.